How would you feel if you met someone who was your complete opposite (in personality and social stature) but who looked exactly like you? Then that person tells you she's your twin?I would probably freak out and then run to my mom and dad! That's what top notch lawyer Bennie Rosato did when it happened to her. She also took on the reponsibility of being the alleged twin's defense counsel in a capital murder case. The last Scottoline book I read was Legal Tender where Bennie was accused of murder herself. In Mistaken Identity , Bennie has already established the all-girl law firm of Rosato and Associates and is living with her boyfriend Grady (who I thought was the murderer back in Legal Tender, hehe). Mary and Judy were in this book too and the former was shown as having second thoughts about her chosen career. Doubts that were later dispelled. This case represented a turbulent time in Bennie's life: she learns that she has a twin, finds her dad, loses her mom, and she is almost killed. It is as if she loses her family - but in the end also learns what family really is all about - just not what she has always thought a family is or should be. 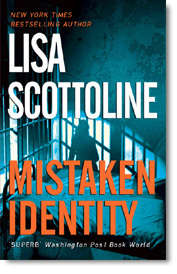 Mistaken Identity somewhat challenges our perceptions of family - is it merely blood and genes or something less tangible? I grew up with a loving family and I have good relationships with cousins, aunts and uncles, and grandparents too. Without a doubt, they are family to me. But I know that my heart also considers family, people who have no blood relation to me. I have lots of kuya's (elder brother), manangs (an older female), uncles and aunties because I grew up in a very close knit community. When Alfred and I started talking about wedding plans I had to explain to him that for my side, close family and friends is still a lot people. Because I had read four of even five other Scottoline novels before this, I felt like I already knew Bennie, Mary (and her parents), Judy, Marshall, Grady and even Lou. I was even waiting for Anne until I realized that her story comes much later. This is what's great about her books, you can feel the familiarity as if you were part of the firm, of Mary's family, yet you wouldn't be lost if it was the first book you read. While preparing for this post, I stumbled upon the author's website and found that she has a Tote bag promo. She sends you a tote bag if you send her proof that you bought two copies of her latest novel, one to give away to a friend. I have been thinking of giving away/reselling-for much less- books that we have here. Maybe I'll launch that project by purchasing two copies of Lady Killer. The thing is, I don't think it's already available locally. I would love to get that tote though. Hehe. ooh - I will have to pick up a copy of this book!